I love century eggs, but I do need to be in the mood for them. My mother once made me eat one (complete with hellish whiff) when I was monstrously hungover. It almost made a reappearance. Meems I love your enthusiasm for your country and its cuisine but I hope your disparaging of the inferior Chinese century egg won't spark some sort of diplomatic incident! 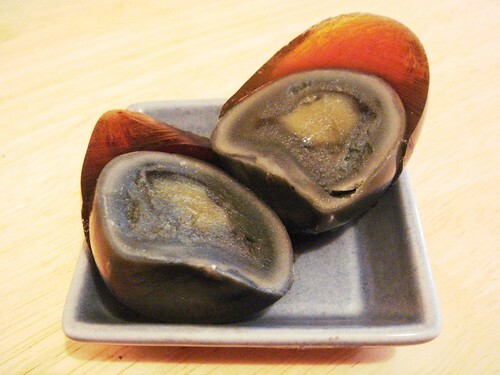 I now know what a century egg looks like, even what it smells like...I'm *almost* tempted to find out what it tastes like! MiMi, thank you for a bright spot in today's reading, even though the egg* is 100% Burmese and looks 100% inedible! I love the tags (egg + meat-free!) 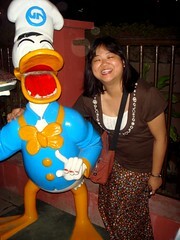 and also your dedication to eating in the cause of the blog! 12 times in one day - wow! *Amazing how apposite the word verification is sometimes: "dedneste" indeed! "a dark green, cream-like substance with a strong odour of sulphur and ammonia" - I'm sold. Actually the salad does look and sound kinda nice - a healthy introduction to century egg addiction. One quick question - what sort of chilli are we talking, an elegant slender tapering hottish one, or a short pug-nosed blow-your-socks of scud of a chilli? @The Grubworm - It IS nice, it is! Chilli heat is entirely up to you - I personally throw in about five scuds, but that's me. 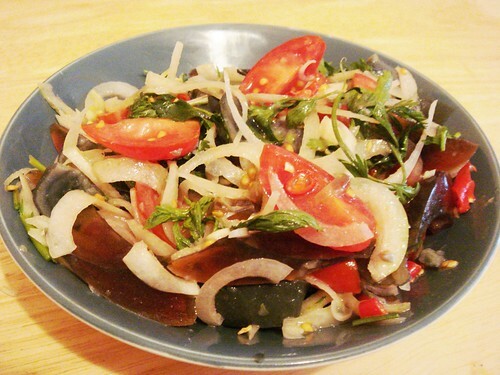 I do like a century egg and this salad looks a nice way to serve them. have to admit to only having eaten the Chinese version though, I must get out more. I love your use of MSG too, I tend to use chicken powder instead (purely for the MSG in it) but tend to keep it a secret on the blog. Next time I get some Burmese ones, I'll bring them back for you. Here, this is what they look like. I have been reading quite a lot of your blog. Not so much into TV series recaps but I like everything else.. I really dig your sense of humour. 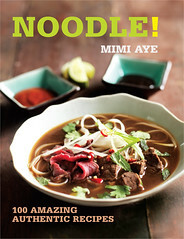 Keep more (Burmese) recipes coming! 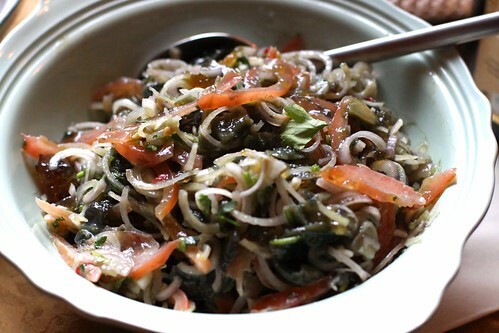 I do miss Burmese century egg salad sometimes although it's not my favourite salad :). I personally like to sprinkle deep-fried crispy shallots and crushed peanuts on it but that might be too busy for some people. MSG is easy and makes everything taste better but it makes me so effing thirsty and I always end up spending half the day going to the toilet. You can always substitute good quality shrimp floss (preferably golden shrimps). Anyone who hates shrimp, a good quality shrimp floss should not taste shrimpy at all. I once found "Medicated Egg" :) in the English menu of a burmese restaurant. I think they translated directly from "say bae u" instead of using more understandable word:"Century Egg". I thought that was really funny. Meemalee the eggs sound fabulous and that salad looks lovely. I must try century eggs soon. @George@CulinaryTravels - Oh, you definitely should! You can find it served with tofu at Lei Wei Xiang. MiMi you are wrong in the head, you'll never get me to eat a preserved egg even if you have done apose with donald ducks drunk brother! Hmmm, interesting. I think I would try this but would want someone (like you) to prepare it for me. 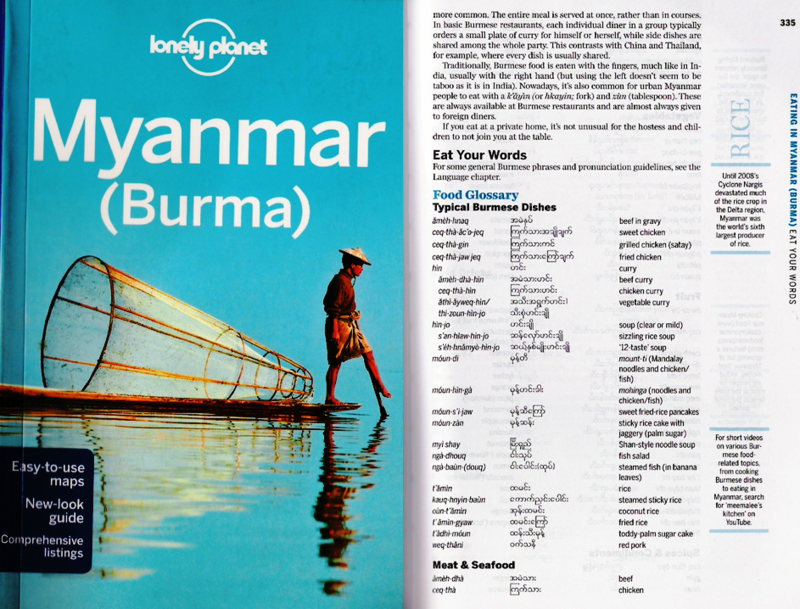 Really liking the Burmese stuff and very interesting about all influences from other places too. I'm fascinated by these eggs. Not fascinated enough to eat one unfortunately. I know, I know. My bad. *hangs head* The Burmese eggs do look less frightening - if pressed, I'd go for them. To make these eggs, you can soak them in horse's urine for 2 weeks :)That's how they use to make them. Never had Burmese ones but used eat a great century egg yum in Thailand and they might have closer to the Burmese sort 'cos they weren't really stanky. 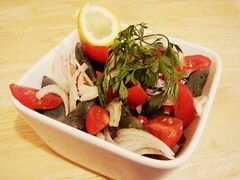 This salad looks like it could be pretty close, delicious. Century eggs? Preserved, 100 year old, funky, stinky, rotten eggs? I'll give you one for experimentation. It's full of OO-MAAA-MEEE, dontcha know. Oh! You are still posting! I thought you'd gone quiet, but it was just a problem with the RSS! Don't suppose there's any chance Mum's House can source Burmese century eggs? I love this one. Looks a bit scary but worth a try. Mum's House do sell century eggs as "preserved duck eggs" but they come from China. You could always ask if they'll get hold of some for you. 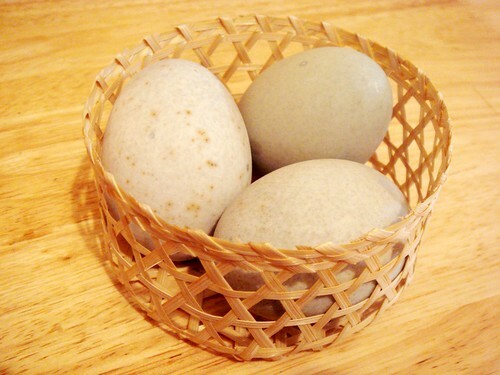 Can you get a recipe for Burmese century eggs. want to make some. what is different to make them golden. @Ed - Hi Ed - I've no idea what makes them a different colour. I would expect that they're not preserved for as long - hence less of a stink as well. I will investigate for you! have you the recipe already? ive had some during a congee party a couple of years ago and its very attractive presentation makes me want to use it in other dishes. Unfortunately i cant find any in the local shops and i was wondering if i cam make them from scratch myself. 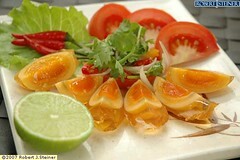 How do the Burmese produce the amber-colored eggs? I have successfully made Century Eggs with the traditional Chinese method and am wondering what the chemistry of the Burmese recipe is. I'd love to try to make them - they are so beautiful! This salad looks awesome and the eggs so beautiful!